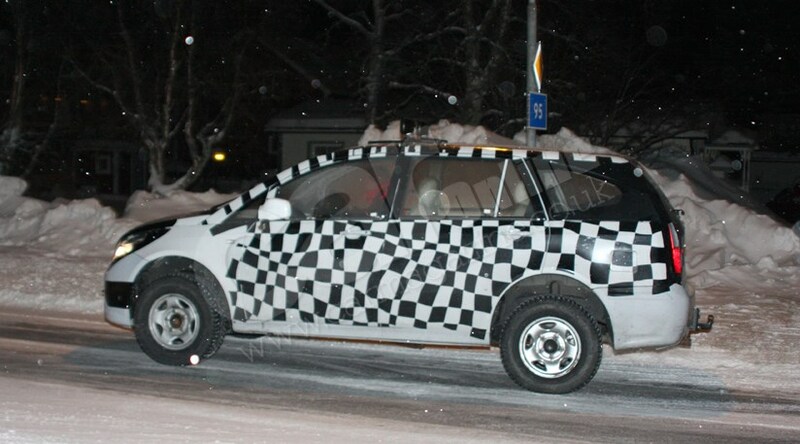 Remember that mystery SUV a reader spied back in November 2008? Well, the uber-informed CAR audience helped us identify it as Tata’s new SUV – internally dubbed Xover – and now we’ve caught it again. These photos capture the moment the Tata Safari replacement swapped its usual warmer climes for some winter testing up in the Arctic circle. Our scoop photographers caught it during a shakedown test in the dark and it looks a remarkably large beast contrasted against the virgin white snow. The ride height is hitched right up on this prototype and it’s equipped with winter tyres to prevent Ratan’s latest model sliding into a snowdrift. The new Tata Safari: is it a seven-seater? It’s hard to tell from these photos. We suspect it will swallow five bodies, but the newcomer does have a pretty long wheelbase that could accommodate a third row of seats, we’d predict after close scrutiny of the side profile spy photo above. This right-hand drive vehicle is UK-registered in Kent, as was the previous reader spyshot of the Tata Xover. With help from our colleagues at CAR Magazine India, we hear it will use a development of the same DICOR engine from the Safari. It’s a 2.2-litre turbodiesel developing around 140bhp and 240lb ft. Drive is sent to two or all four wheels – making this an unusually cheap alternative to a Land Rover Discovery.